The euro has returned the dollar the part of its previous sessions gains and closed the trades with losses. The October German retail sales are expected with a growth + 1.5% m/m vs. -3.2% m / m in September as the consumer spending in France where it can be + 0.2% m / m after -0.8% m / m. According to the preliminary assessment the consumer price index (CPI) is forecasted with the reduction to 0.3% y / y vs. 0.4% y / y in November. The pair EUR/USD tried to develop the upward dynamics above the level of 1.2500, but the pair came under pressure at the level of 1.2523. Gradually declining, the euro tested the local support near 1.2465 that was later broken through, resulting in the decrease to 1.2444. 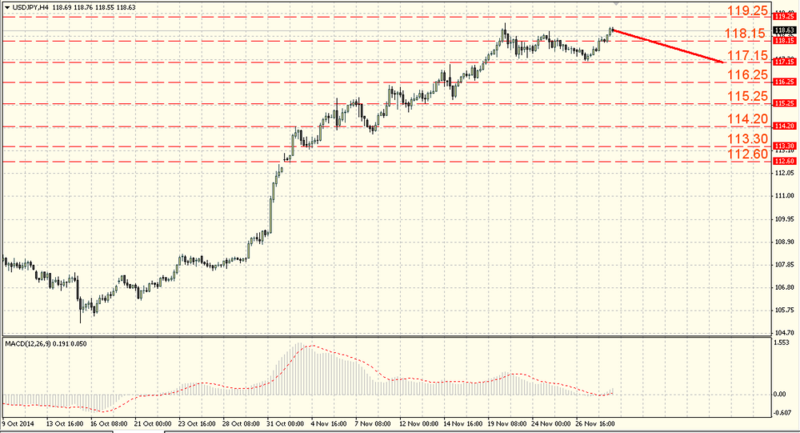 The support levels are 1.2405 – 1.2425, and the resistance levels are 1.2500 – 1.2520. MACD is in a neutral territory. The inability to break upwards and to consolidate above 1.2500 keeps the risks of the renewed decline. The euro can fall down to 1.2400-1.2358 in the short term. The British pound fell against the dollar. The main pair driver were the technical factors, presented by the strong resistance. The GfK consumer confidence index showed the predicted 2% in November and the Nationwide housing prices noted the growth rate decline by 0.3% m / m, 8.5% y / y vs. 0.5% m / m, 9.0% y / y in November . The pair also was traded with the positive attitude, rising up to the level of 1.5826. Being under the pressure from sellers’ part, the pair resumed its decline as a result the support around 1.5766 was broken through and the pound fell down to 1.5704. 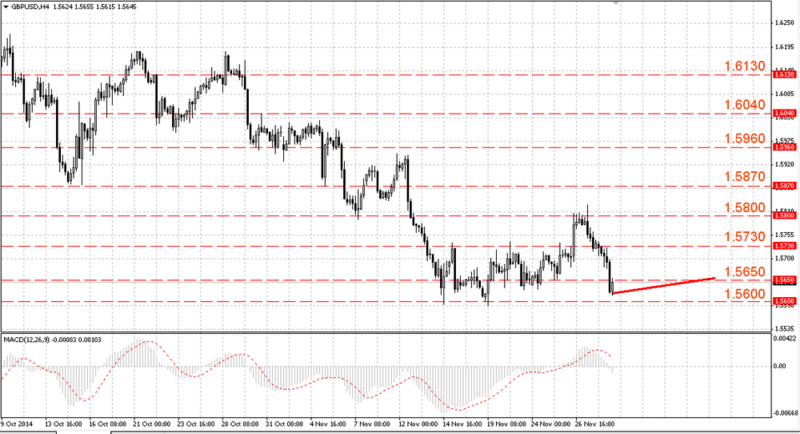 The support levels are 1.5580 – 1.5600, and the resistance levels are 1.5650 – 1.5650. MACD is in a negative territory. Its attempts to rise above 1.5714 are faced with the interest for sale that suggests the pair decrease to 1.5657. Now it needs to return back above 1.5766 for the growth resumption. The Japan stock market decrease has led to the pair fall. Later the dollar leveled its losses and closed the day with a slight increase against the yen. The October indicators showed that the household spending slightly rose-4.0% y / y vs. -5.6% y / y in September, inflation fell more than expected the CPI noted + 2.9% said y / y after + 3.2% y / y when it was expected + 3.0% y / y, but the unemployment rate fell down to 3.5% from 3.6%. The pair rose from the support near 117.23 to the level of 118.33. Bulls did not manage to reach the highs at the level of 118.57 this time and the pair rebound is still limited by support around 118.08. The support levels: 117.95 – 118.15, and the resistance levels: 119.25 – 119.45. The MACD indicator is in a positive territory. The dollar growth can be limited by the current high amid the pair overvalued and the last week US labor market data, but bears are unlikely to move below the support around 117.23.